There’s a large warehouse on the northern end of the 1200 block of Hamilton Street (in the middle of our 1981 image) that’s no longer standing. It’s probably the largest building no longer in Yaletown, (lost to a fire) replaced in 2002 by the Opus Hotel. In 1912 W O’Neil & Co were shown here for the first time. We think this must be a warehouse associated with William O’Neil’s building supply business, based on Seymour Street. Canadian Pacific Railway released the land for development around 1910, and the entire area built up in only a couple of years. While we can identify almost all the permits for the Yaletown warehouse buildings, this location has proved elusive. The O’Neil firm was founded in Vancouver in 1898,. Among the items they sold was stained glass, initially acting as an agency for the noted Canadian stained and art glass firm of Robert McCausland of Toronto. By 1910 it appears that the company employed artisans in Vancouver, and the company’s 1913 catalogue said “We employ a competent corps of artists and are in a position to contract for and execute anything in the Art Glass line, from simple geometrical lines to the most elaborate memorial and ecclesiastical work. The following pages give just an idea of what we are continually doing, and we have an extensive portfolio of beautiful designs in Leaded Lights to select from, or we can submit designs for special work. Hand painted designs executed and fired in our own Kilns.” William Nelson O’Neil was from Brampton, Ontario, and unlike many of his business colleagues, who were initially in the West End, and later Shaughnessy, he chose to live with his wife and daughter in Fairview. By 1920 this had become a storage warehouse – Mr. O’Neil was also president of the Western Warehousing Co, who operated the large warehouse, although by the mid 1930s it had become the Christie Brown biscuit warehouse, and by the mid 1940s the Hudson’s Bay Company were using the building as their service department. Next door, the 3-storey building was developed for Woodward Department Stores Ltd, and designed by Smith and Goodfellow. The $25,000 warehouse and stable was built by McNeil & Campbell. It was later used by the national Furniture Co as their warehouse. In 1981 there was a vacant site next door; in 1996 Raymond Ching designed a 12 unit condo building called Greenwich Place. It’s not completely clear from the street directory, and there are relatively few early images of this street, but it appears that the residential building might have been the first structure built here. Next door we can just see the edge of a five storey warehouse that supposedly only cost $20,000 to build, designed by W J Kerr for J & A Phillips, and built by the owners in 1912. Today it’s a strata commercial building with Rodney’s Oyster House downstairs. Crossing Granville Bridge in 1995, it was possible to look over and take this picture of the southern end of Yaletown, with Carlos n’ Bud’s Tex-Mex restaurant operation in a converted 1936 garage. This part of Pacific Street had originally been developed with houses around the turn of the twentieth century – there were four homes here built before 1901. By the 1930s the area was much more commercial, and the new car repair facility (addressed to Seymour Street) was shared by Len Cooper’s Signal Service, selling gas and oil, and Bentley’s Automotive Service Garage, run by William Bentley who lived in West Vancouver. There had been an Imperial Oil gas station across Seymour to the west in the 1920s, but by 1937 it had become the Atlas Tire Depot. This location remained a garage; from the 1930s until at least the 1960s Hammond Ltd’s garage operated here, with an additional workshop on Pacific Street across the lane to the east. Thomas D Hammond was president, and by the mid 1930s lived in North Vancouver. Tom Hammond had started the Central Garage on Seymour in 1929, moving from the prairies having learned his mechanic skills during the first war. He took over this location a few years later, running both the gas station and the repair garage. In 1949 the station was selling Shell gas. On the next street across, Richards Street, there was a storage warehouse originally built around 1929 for Johnston Storage. Residential uses gradually returned to this location as plans to increase the residential population Downtown slowly became reality from the early 1990s. Pacific Point, the two white towers, were completed in 1990 and 1992, designed by Eng & Wright. The workshop part of the Hammond Garage was developed by Onni and Amacon as the 501, a 32 storey condo tower, completed in 1999. More recently Onni also developed The Mark, replacing the Bud n’ Carlos property with a 41 storey tower that includes a childcare centre. Just completing on the warehouse site, Onni have developed another tower incorporating a childcare – this one 43 storeys called The Charleson, with a rental podium and condos in the tower. Alongside is another 45 storey tower, designed by Dialog (who also designed The Mark and The Charleson) in this case for Wall Financial, who have decided to rent the units rather than sell them. This two storey warehouse dates to the same year as its neighbor; 1911. This was also designed and built by a builder recorded on the building permit by the City’s clerk as ‘Snider, Geo. & Brethune’. The City Directory listed ‘Snider and Brethour’, run by George Snider and Edgar Brethour, and John S Brethour. Sometimes the Building Permit clerk got the company name right – as there are several other significant buildings listed as being built by Snider and Brethour. George Snider was from BC, born near Sooke and living in Victoria with his wife Amy in 1901. Both Edgar and John Brethour were also born in BC, outside Victoria. They were almost certainly cousins; both their fathers were from Ontario, and both were farmers. Their client here was the Mainland Transfer Co, confirmed by the 1911 Insurance map who label this building as Mainland Warehouse. Mainland Transfer was incorporated on May 28, 1902, with a capital stock of $50,000, in $100 shares. It seems to have been created by taking over the interests of Atkins & Johnson, who had been in the city from the 1880s. Mainland’s 1902 premises at 120 Water Street were where Atkins and Johnson had been a year earlier. Those gentlemen had gone on to run the Hotel Metropole. The company became much bigger in 1904 when Gross and McNeill merged with them and Frank Gross (from New Brunswick, arriving in Vancouver in 1887) became manager. John D McNeill, from Ontario and Frank Gross founded their draying and transfer business in the late 1890s. After the merger McNeill briefly became general manager and then 1n 1906 left Mainland and became president of Great Northern Transfer, (handling all the freight related to the Great Northern Railway) and the Vancouver Coal Company. Mainland Transfer grew significantly in 1906 when it combined operations with the Vancouver Warehouses Ltd. By 1913 Frank Gross was Manager of Mainland Transfer, based on Pender Street, and a director of Vancouver Warehouses (whose warehouse was on Beatty Street) Willie Dalton was both manager of the warehouse company and secretary-treasurer of Mainland Transfer. He arrived in Vancouver (from Huddersfield) in 1904. Robert Houlgate was President of Mainland Transfer in 1913, and he also had a Yorkshire connection, as he had been a bank manager in Morley before joining the Huddersfield based but Vancouver located Yorkshire Guarantee and Securities Corporation, Limited in 1898. In 1920 this was Mainland Transfer Co Warehouse No. 3, but they shared the premises with Sawmill Machinery Co, Holbrooks Ltd (who were pickle manufacturers) and Crane Co.’s warehouse. In the mid 1930s Gold Band Beverage bottlers were here alongside Gilchrist Machine Co who sold logging equipment, the BC Feed and Egg Co who wholesaled feedstuff, and the Ford Motor Co who assembled vehicles brought in to the rail dock at the back of the building. By the end of the war there were several different businesses here, including Restwell Upholstery, the Green Mill Coffee Shop and the Railway and power Engineering Co. By the late 1950s this part of the 1000 block of Mainland Street was owned by T Eaton and Co. Eaton’s had a showroom in this lower building, and a warehouse in the three storey building next door, which they had occupied from the early 1940s. These days the building has a variety of tenants including a private 30 student elementary school for children aged 5 to 9. In 1911, the year before this building was developed, Clarence Tingley was Secretary & Treasurer of the Vancouver Transfer Co Ltd, living on Howe Street. Fred Tingley was Manager of the same company, and in 1911 lived in Kitsilano. Both brothers were born in British Columbia; Clarence Harper Tingley in 1869 and Frederick Chipman Tingley in 1873. Their mother died the year after Fred’s birth. Their father, Stephen, was born in New Brunswick, and came to BC in 1861 to prospect in the Cariboo Gold Rush. After years of no luck (despite walking from Yale to Williams Creek, a distance of 370 miles, carrying a 100 pound pack), he was hired as a stage driver for the Barnard’s Express in 1864. Known as the “Whip of the Cariboo”, he incorporated as a partner with the British Columbia Express Company in 1871 and drove stagecoaches in the Cariboo region over what was then one of the most hazardous roads in North America. In 1886, Tingley became sole owner of the express company which he ran for before selling out in 1894. He had bought a ranch at 108 Mile House, still standing today, where he built the BX Barn Service, stabling stagecoach horses. He sold out for $11,000 in 1903, and increased his fortune as the “Discoverer of the Nicola Coal & Coke Mine”. Fred came to Vancouver before Clarence, and managed the Vancouver Transfer Co, originally established by Francis Stillman Barnard of Barnard’s Express, while Clarence was still ranching. By the early 1900s they were both involved in the Transfer Co, and in 1912 Tingley Bros hired ‘Snider, Geo. & Brethune’ (according to the building permit) to design and build a 3-storey warehouse in the CPR Reserve on Helmcken Street – which we’re almost certain has to be this building (as we’ve accounted for all the other Helmcken Street buildings built around this time). In fact, the builders were George Snider and Edgar and John Brethour, who ran their business from offices in the Dominion Building. In 1911 Clarence was living with his wife Blanch, born in Nova Scotia, and their three children, Elizabeth, Stephen and Hall, all aged under seven. Fred was living with his Scottish wife Sarah and their three daughters, Jean, Henrieta and Myrtle, all aged five and under. The new building served double duty; it was the stables for the Transfer Co, and also home to the Elevator Supply & Equipment Co Ltd, managed by Arthur Gamwell. In 1920 the Transfer Co still had their stables here, but shared the building with the Chevrolet Car Company. By 1930 there were multiple tenants, including the Orange Crush Bottling Co and the Van Loo Cigar Co. In 1940 when this Vancouver Public Library image was taken, Tingley Brothers still operated here, although now they were listed as ‘property owners’. Clarence died in 1942 and Fred in 1947. In 1940 the building was used by T Eaton and Co, and United Milling and Grain. By 1950 the entire warehouse was occupied by T Eaton and Co, and by 1970 Dogwood Wholesale Stationery were in the building. Over the years the Yaletown warehouse district became under utilized and run down. In 1988 Simon and Associates designed a radical change of use for the vacant building, designing a boutique hotel conversion. The use never took off, although the additional floor, balconies and curious ‘bay’ windows are a legacy from that idea – and instead a 64,000 sq. ft., multi-tenancy design centre (showroom/office) project was created. Yaletown Galleria still operates today, with a mix of retail and office tenants. This 1970 Archives image shows how little this part of Yaletown has changed in nearly 50 years – at least physically. There are far fewer added street trees on this side of Homer Street, so you can still see the buildings. That’s not true of the west side or many other nearby streets, especially to the west of here in Downtown South; (the area realtors like to call Yaletown, or sometimes New Yaletown). We looked at the history of 1138 Homer, the Frank Darling Block, in the previous post. That’s the three storey building to the left of the telegraph pole in the centre of the picture. Next door is a 2 storey building that also dates from 1913 and like its neighbor cost $40,000 according to the Building Permit. It was built by R & F Watson for Adamson & Main, who claimed to be the architects. The same developers, Adamson & Main, were also responsible for the adjacent five storey white brick building at 1180 Homer developed in 1910 and designed by architects Campbell & Bennett, costing $35,000. (Only four storeys are visible in the picture, and there is also an additional storey on all of these buildings on Mainland Street where the other façade of this block is a full storey lower). Adamson & Main are a mystery. The only reference to any partnership under this name in contemporary sources is for the permit for this building. There are only a few possible people called Adamson in the city between 1910 and 1914; one possibility is Robert Adamson who was the accountant for the BC Sugar Refinery; the only other well paid Adamson was J Adamson who was Chief Engineer on the Empress of Russia (and in the 1900s on the Empress of India). He seems more likely to be the developer partner, as James Adamson hired the same R & F Watson to design and build a $15,000 apartment building on Oak Street in 1914. James Adamson had been first chief engineer since the Empress service was started in 1891, and he would have been well paid. His appearance in the street directories (but with no home address) suggests Vancouver was his home base. J Adamson had Parr and Fee design a $2,000 house on Burrard Street in 1903, although nobody called Adamson appears to have lived there. J Adamson appears in the 1901 census, but apparently aboard ship (as most of the members of the recorded ‘household’ are ship’s crew, including the Head of Household who was the First Mate). Apart from identifying his job as Chief Engineer, and that he was of English origin, all other details are missing. The ship would have been The Empress of India. Adamson was Chief Engineer on the Empress of Russia from her maiden voyage in 1913 when she broke the record for crossing the Pacific in an easterly direction by 28 hours. He ended his career in 1919 as Chief Engineer on the Empress of Asia. Main could have been James Main, a hardware merchant, but David Main, is a much more likely candidate. A 1914 biography said: “for many years he has been engaged in the building trade but now practically spends his time in looking after his valuable realty holdings.” He was from Nairn, in Scotland. His father was a sea captain who “at the age of seventy-three years died suddenly of apoplexy, passing away after four hours of illness.” David Main trained as a carpenter, arriving in Philadelphia in 1887 where he worked as head carpenter on a training ship before moving to Vancouver in 1891. For a few years around 1900 he worked in Atlin in Northern BC, where he shipped lumber to White Horse and built the hospital and the Presbyterian church. On his return to Vancouver in 1902 he briefly worked as a carpenter before running a building materials company with T G McBride before retiring to manage his property interests in 1911. The taller, narrower white brick building is known as the McMaster Building these days, and was turned into condos ten years ago. The original plan was to renovate the building, but it was in such poor shape that it had to be completely rebuilt with the façade retained and tied into the new structure. The original tenants in the building were William J McMaster and Sons. William was from Northern Ireland as was his wife Elizabeth and they had at least five sons, four of whom were shown in the census living at home in Toronto in 1901. It appears that for a while William also lived in Vancouver: he was shown on Georgia Street in 1901 and Haro Street in 1904. James was shown living in the city as early as 1899, and W J appeared in 1897, living at the Mountain View Hotel and a year later in the Leland Hotel. In using Census records we quite often note that someone resident in the city according to the street directories was missed by the census. In this unique example, William, James and Edward McMaster are shown living at home in Toronto and also lodging in Vancouver in the 1901 Census. The Vancouver directors were James and Edward McMaster. Edward had been born in Montreal and attended Trinity University; a 1914 biography says he worked as a travelling salesman for the family company before taking on the sales manager’s role in the newly established Vancouver location in 1906. Actually he was already resident in Vancouver in 1901, and married here in 1904 to Mary Stewart, from Glasgow. He was elected an alderman in 1911 and was a Director of the Vancouver Exhibition Association. His brother James was also in Vancouver in 1901, marrying Lena who was from Ontario. The company was a clothing wholesaler, and street directories show that their earlier premises were on Cordova, operating as Manufacturer’s Agents, specializing in Gloves and ready-to-wear. They lasted a very short time as W J McMaster & Sons – but they continued to operate from the property. In 1916 the BC Shirt and Overall Manufacturing Co were here: James McMaster was the foreman and Edward the manager. A January 1916 edition of ‘Industrial Canada’ noted that “McMasters Ltd., manufacturers of shirts and overalls, Vancouver, have sold their undertaking to the B. C. Shirt and Overall Manufacturing Co., Ltd.” The Manufacturing Co was a new operation, incorporated that year and capitalized at $25,000. There had been a severe depression of the economy before the war, and in many cases businesses already in existence carried out a re-arrangement of business to avoid bankruptcy. This doesn’t seem to have helped the McMaster operations: both 1176 and 1180 Homer were vacant in 1917. By 1919 the Ives Modern Bedstead Co were in 1176 Homer and Torry-Lee storage in 1180. James McMaster had a job as an accountant with Fleck Brothers, a job he retained for several years. Edward’s employment isn’t noted in 1919, but in the early 1920s he was a manufacturer’s agent. 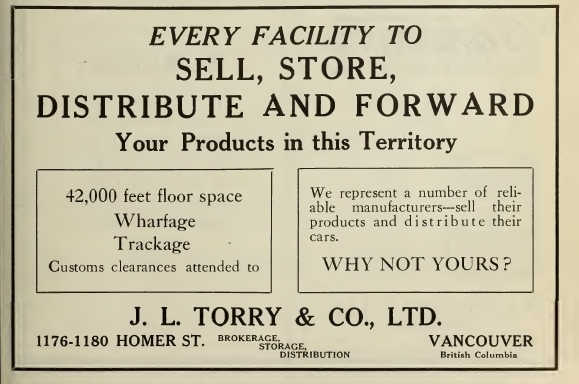 James L Torry was an importer, and the Homer Street facility was his warehouse with the storage and distribution business offered as an adjunct. By the mid 1920s another firm moved in, Pioneer Envelopes Ltd. Envelopes were obviously the thing on Homer Street. Pioneer were here right through to World War Two, and the company still exists in Richmond and Langley. They were replaced in the 1950s by the Norfolk Paper Co. The McMaster name was still used for the building. The shorter building to the north also saw variation in tenants and change over the years, with, among others, an upholsterer, an outdoor advertiser and De Laval Co Ltd, dairy supplies (who were in the building for several decades). Closest to us is the Smith Davidson & Wright warehouse , also selling stationery, designed by Ted Blackmore in 1909 and completed in 1911. 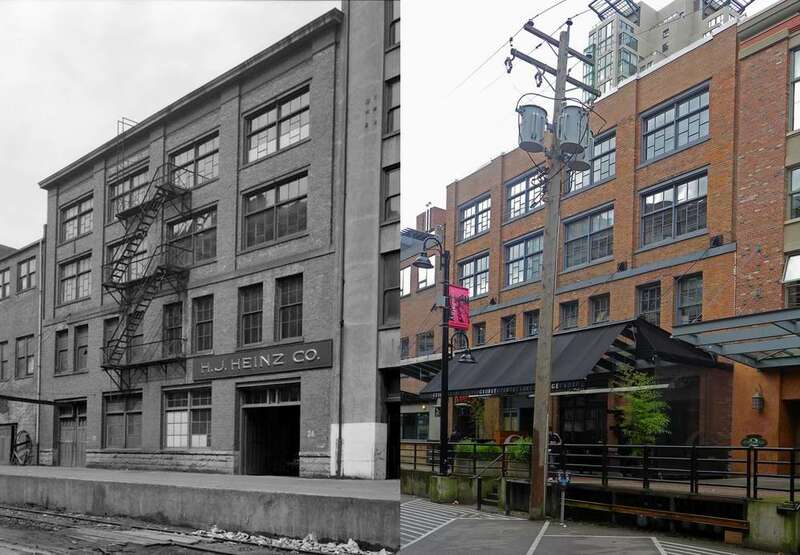 This is another of the Yaletown warehouse buildings built after the Canadian Pacific railway released some of their land for development around 1910. Frank Darling & Co built this warehouse in 1913. Honeyman and Curtis were the architects, Frank Darling was the client, and Irwin Carver and Co were the builders of the $40,000 structure. Frank Darling was an electrical equipment supplier, living on Nicola Street in 1911 with his wife Frances and their three young children, David, Elizabeth and Ruth. He was born in Montreal, Quebec, Frances was American, and the children had all been born in BC. Frank’s company was established in Vancouver in 1906. Frank was one of four brothers (with Arthur, Edward and George) who owned Darling Brothers, founded in 1888. 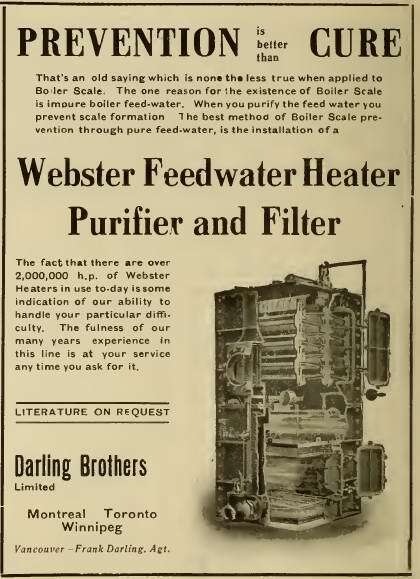 Frank set out on his own in 1906, leaving the day-to-day management of the manufacturing arm of Darling Brothers to his three siblings and acting as an agent for their products in British Columbia. At the height of its production the Darling Foundry was the second largest operation in Montreal, with over 100,000 square feet of space. Each of its 4 buildings was dedicated to its own specialized purpose: inventory & stock, a showroom, the iron works, and the assembly plant. The company closed in 1991, and in the early 2000s repurposed as an Arts Centre. In Vancouver, Frank’s business stayed here until the 1940s, sharing the building with Rennie Seeds for a while after the war before moving to premises in Burrard Slopes. Advertisments in the Vancouver Daily World offering space for lease suggest that Frank continued to own and lease the parts of the building his own business did not need. In this 1924 picture H J Heinz were using the Hamilton side of the building as their warehouse, staying here through to the 1930s. In the early 1950s a variety of companies operated here including Industrial Adhesives and Barclay & Co, importers and exporters, joined rather unexpectedly by the Consulate of Spain. Frank was still alive in the early 1950s, but retired from the business, with the former manager, W G Metcalf as President of the company that still dealt in pumps and other machinery. In 1973, when the image was taken, Luxford International Housewares were operating their warehouse here. Today it’s the Brix and Mortar restaurant on the main floor (on the Homer Street side) next door to the New Oxford pub, with another restaurant on the lower loading dock floor and a market research company occupying the upper floors.